The NHL Upper Deck Young Guns rookie cards have been wildly popular since the first came on the scene. 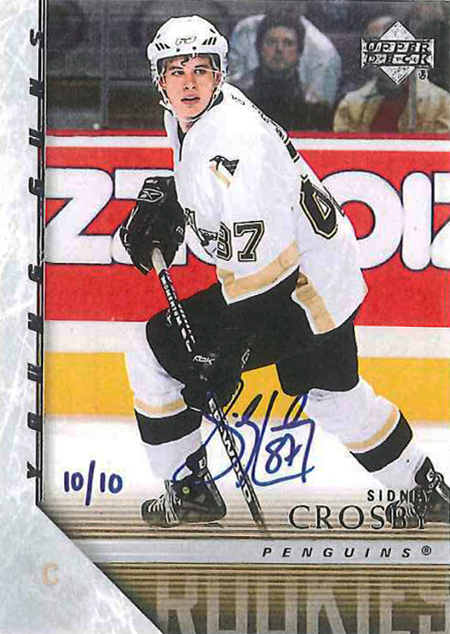 Perhaps the greatest one of all-time is the 2005-06 NHL Upper Deck Young Guns card #201 of Sidney Crosby. Sidney’s impact on the game has been amazing and he is currently battling back from the lingering effects of a concussion to regain his status as one of the top players in the NHL. And we think he will get there. Recently Sidney has been taking some time to sign some outstanding redemption cards for fans that we are in the process of receiving in, checking for quality, packaging and shipping. We anticipate we will receive more cards from him when he can make time to help put any of his other outstanding redemptions to bed. In the allotment we just received back we had a very special card signed that we were able to include in 2011-12 NHL Upper Deck Series One as a surprise insert. He signed ten copies of his famed Young Guns rookie card and they are now waiting for fans to discover them in packs of Upper Deck’s flagship release. Holy Hockey Puck!!! Sidney Crosby signed ten copies of his original Upper Deck Young Guns rookie cards and they were inserted randomly into packs of 2011-12 NHL Upper Deck Series One! If you are looking to purchase one of these rare cards in the secondary market, make sure it has the matching Certificate of Authenticity from UD like you see here. Ten hard-signed copies are out there now of one of the most important modern day rookie cards of any sport. Who will be lucky enough to discover them as they rip packs of 2011-12 NHL Upper Deck Series One? Only time will tell. Wow, that is a great cards, up there with the Jeter ’93 SP buyback. 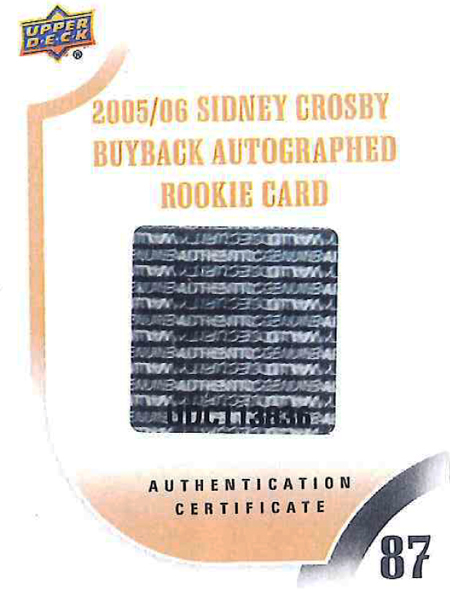 wow wish I could get one of them Sidney Crosby auto’s !! I can’t even get a nobody I’ve never have opened a pack or a box with an auto in it !! I would die for the Sid the Kid one as he is the greatest player ever in my books !! My father in law and I opened a box each on Christmas day. I pulled a Dale Hawerchuk Jersey, he pulled a Sidney Crosby buyback auto, 6/10. Needless to say, he won the pack wars. YOU guys put out the THE best card packs and speciality CARDS in THE business !! !